We offer dryer vent cleaning service. The U.S. Consumer Product Safety Commission (CPSC) estimates that 15,500 fires associated with clothes dryers occur annually. These fires account for an average of 10 deaths and 310 injuries and more than $84.4 million in property damage annually. 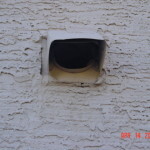 (I purchased my home in 2003 (it was built in 1985 and the Dryer Vent has never been cleaned to my knowledge, so I understand the need for safety especially after taking a real close-up view). Lint accumulation and reduced exhaust airflow feed on each other to provide conditions ripe for a fire. Lint is highly combustible and decreased airflow causes overheating of the exhaust environment, demanding excessive cycling of the high temperature limit switch and eventual failure. If your clothes are taking longer to dry or if the velocity of air exhausting from the dryer vent hood is minimal, maintenance is needed. Clothes dryers are prone to lint build up if there are numerous 90’s in the system or the distance is excessive. Bring in equipment, extension cord, air compressor, tubing and ladder if required. Remove louvers and start cleaning process – either on side of home or inside laundry room upstairs. Clean up and remove lint from ground, if necessary go inside and clean from inside. Remove all equipment and ask for payment. ProBest will send you a reminder postcard, Fire Authorities recommend a yearly inspection and we will send you a reminder yearly. Better safe than sorry! Pricing depends on the location of the dryer to the outside vent see pricing examples, for example mine is in the garage and goes up over the top of the door frame and then 15 feet to the outside. This prompted me to also go from inside and clean it (see pictures below). Then I noticed the plastic hose and I decided to replace it with the semi -rigid aluminum duct. Call ProBest Services today for a quote for dry vent cleaning service.